Let me introduce myself ….. I know many Museo clients know me well, and some have even known me since I was 21 and have been with me since my first salon days in Fremantle. But there are probably just as many of you who only glimpse me and don’t know a thing about me. So, here is a little work history. For many years I worked as an Aesthetician and Shiatsu Practitioner, specialising in advanced skin therapies, acne treatments and relaxation services. As our business grew our family grew with the arrival our two gorgeous girls now aged 14 and 10 years. Throughout the past 2 decades I’ve worn many hats and worked in a variety of roles within Museo. Having expanded and renovated the business 4 times in the past 18 years and at times having close to 40 employees, Museo has certainly kept me very busy, but it also ignited my business mindset. I love all things business (well not the paperwork so I have help) but I like the changes and challenges that come with being in business. There have been times when it has certainly been too much – the juggle of parenting whilst running a small business, like who looks after the kids when you both want to be taking the meeting and being a husband and wife team and living it 24 hours a day teaches you to instil boundaries the hard way– I’ve learnt not to sweat the small stuff. I’m now well into my forties. It’s not so bad. I have a terrific husband and kids I adore who I’m certain adore me back and still love to hang out with me, I have a great family and beautiful supportive girlfriends who understand me and I them. I’m established in my career and stimulated by my work and more confident and comfortable in my skin than ever before. I recognise how important time is and that the choices we make today with the quality of our eating, exercising, mental stimulation and relaxation will affect how well we age into our 60’s, 70’s 80’s and I hope our 90’s. I’m at the point where you realize you need to put certain things into practice if you want to lead a happy and healthy life and that you need to continually find that balance of incorporating the important elements in life that you personally need ( it differs for us all )to stay fit, healthy and ‘feeling like you’ amidst the general duties of being an adult, work life and for those of us that are also parents and carers for others. Life can be crazy….. I love being able to offer a haven where you can come back to being just you. Whether it is just coming to have your hair done each month to look like the normal you or to enjoy a relaxing massage to unwind the mental stress and tight body to feel like the normal you or to improve and enhance your skin so that you have a more confident you fills me with joy and I love that so many men and women understand the importance of taking time for yourself and that when coming to Museo we look after you the moment you walk in the door. I’m a prolific reader of everything and I’m not a gimmicky girl at all. Only if it’s proven to work, has the research behind it and we’ve trialled it, will it be offered at Museo. Combining different modalities and skin treatments will give you the best success, whether we are treating a skin condition, disorder or general aging. One of my favourite skin treatments to have that’s quick and easy and gives fantastic results is a Dermal Peel and if you’re looking for a serious skin transformation, a series of Dermal Planning peels from O Cosmedics may be the answer. Based on medical strength actives, pure, chiral ingredients, biomimetic and encapsulated carriers, Pro. Dermal Planning treatments offer intense skin changing results, skin youth, health and radiance. A fantastic combination of medical grade ingredients while remaining paraben, petrochemical, preservative and SLS-free. Bespoke dermal planning skin treatments can transform the skin to achieve cell optimization… and O Dermal peels offer 2 perfect entry-level enzyme peels for the most unexperienced of skins or alternately the first step in a double power peel combination treatment for serious skin changing results. POMEGRANATE PEEL: The ideal entry level peel for even the most sensitive of skins to renew and boost hydration. PUMPKIN ENZYME & FRUIT ACID PEEL: A gentle yet effective enzyme peel for all skins especially for sun damage and age correction. Pumpkin Enzyme & Fruit Acid Peel is a perfect formulation of 30% Pumpkin enzymes, pumpkin extract and natural fruit acids married together with the healing and moisturising benefits of Jojoba esters making this an ideal peel for all skins. This peel effectively eliminates redundant cells therefore accelerating the skin’s cellular renewal to reveal fresher, smoother skin whilst restoring natural barrier function and increasing hydration. An ideal entry level peel. CATALYST RETINOL PEEL: The perfect Vitamin A anti- aging peel, perfect for all skin types looking for skin health, repair and correction. Concentrated levels of pure Retinol and encapsulated Retinol, Niacinamide and Natural Fruit Acids work together to counteract skin aging, improve the appearance of UV damage, normalise keratinisation to improve the skin’s cellular renewal process, refine and resurface the skin, even out skin tone and provide potent anti-inflammatory activity in even the most weakened skins. OXYGENATING ENZYME PEEL: The perfect peel for all skin types, an instant pick me up to awaken, renew and smooth even the most tired of skins. Perfectly formulated with high levels of Natural Fruit Acids, Papaya, Pumpkin and Pomegranate enzymes and perfectly Infused with intense oxygenating and moisturising super peptides! This treatment increases desquamation and in turn hydration of the skin cells whilst significantly accelerating the skin’s cellular renewal process. Hydrate, plump and renew the skin in just one application! BIO-WHITE PEPTIDE PEEL: Hi-strength vitamin C and peptide peel, especially for pigmented, uneven skin tone, dull and devitalised skins. ALPHA-BETA PEEL: “The serious”, resurfacing peel, perfect for skins looking for intense skin correction and transformation. This amazing treatment recruits intense concentrated levels of Lactic Acid, AHA’S, Salicylic Acid and Niacinamide to offer exclusive Biomimetic desquamation which seriously rejuvenates the skin, reduces fine lines and uneven pigmentation, improves skin smoothness, clarity and radiance and activates cellular regeneration for a brighter, smoother and more even toned skin complexion! Perfect for oily, problematic skin that it is need of extreme exfoliation. Push your skin further with our advanced power peeling – double layered peels! Whether it be double enzymes, layering of peels or applying leave on peels for 5 + hours, these are the seriously skin transforming treatments you want to have. These can be done as a once off booster although for superior results we recommend a bespoke peeling program of 4-6 peels to achieve dramatic results! Call us to talk to one of our experienced Skin Clinicians for a skin consultation to see which peel and dermal plan will be right for you, your skin and your lifestyle or alternatively book a Peel consult online today. It’s all about saving these days and getting the best bang for your buck. 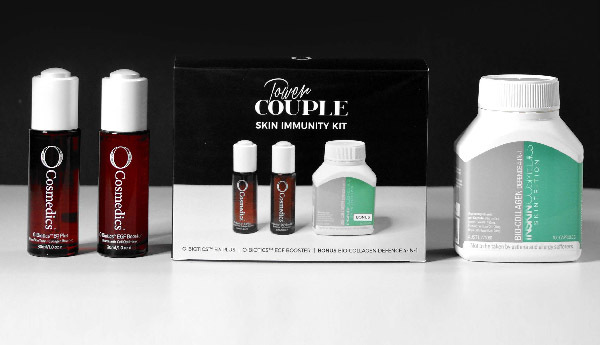 I have 5 available O Cosmedic Skin Immunity Kits that have fantastic value and contains 2 bonus offers ! Read below and phone our team on 08 9371 2299 to secure yours today! EXCLUSIVE OFFER! O COSMEDICS O-Biotics high performance duo B3 Plus and EGF Booster come together to support the ultimate in cell optimisation and skin health. The Skin Immunity Kit offers exceptional skin results and incredible value with not one but two bonus offers! O COSMEDICS SKIN IMMUNITY POWER COUPLE + 1 KEY PRODUCT BENEFITS O-BIOTICS EGF Booster: Formulated with a trio of advanced peptides to stimulate cell proliferation, epidermal growth factor, collagen production and support the life of the cell. Perfect for skin healing, cell induction and anti-aging. O-BIOTICS B3 PLUS: 12% Niacinamide (B3) supports the skin’s immune system, treats pigmentation, acne, rosacea, reinforces skin’s barrier function and is a vital source of cellular energy. Trylagen™ promotes collagen synthesis and stabilises the life of the new protein whilst B-White acts as a tyrosinase inhibitor. This is our no 1. seller and one booster I can’t live without ! SKINTRITION BIO-COLLAGEN 4-IN-1 DEFENCE: 4 powerful ingredients; Grapeseed Oil, Evening Primrose Oil, Royal Jelly and Marine Collagen to support collagen health, improved elasticity, plumpness and skin glow. Skins looking to PREVENT or CORRECT structural degradation, challenging skin conditions such as compromised, acne, rosacea, hyperpigmentation and aging. HOW TO USE Prevention: EGF Booster A.M, B3 Plus P.M, use under O hydrator. Bio-Collagen 1 capsule twice a day Correction: EGF Booster followed by B3 Plus A.M & P.M, follow with O hydrator. Bio-Collagen 1-2 capsules twice a day. Speak to me in regards to using as a prevention or correction home care routine.